Got a few old kites in the shed, and I feel like they could get a second lease of life as kitewing. Keep the wingtip sections up to a bladder, and join together somehow with some sort of angle. Like PVC piping elbows. Shall we open a DIY section on the forum? Good luck, I have tried a few earlier wing designs and sizes, and just because it “looks like a wing”, they have vast performance differences. This looks like Sky downwinding with the wing? Sky has removed it from his Instagram, so if he wants this removed, I will. I have seen the release date of the Duotone wing quoted as 17/6/2019? Last edited by ronnie on Wed Apr 10, 2019 1:28 pm, edited 2 times in total. Dan thanks for your informative post. Any idea if Duotone is going to bring a product to market soon.. like this season? These beach closures are the reason that as a kitefoiler i got into windfoiling, it turns out it's super fun, especially shutting off the sail and going straight downwind for hundreds of meters at a time. You're not getting pulled off the swell like with a kite.The depower of these wings looks incredible. I could see these wings being a replacement for my smallest sails, assuming they upwind okay, though i don't believe they would be feasible in anything below 20 knot for the average mortal like me. 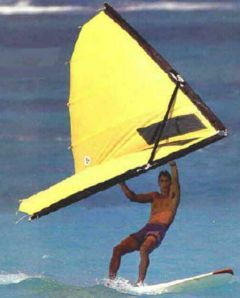 Robby with presumably a Naish wing prototype? Robby's old mate Pete Cabrinha way back in the day with another wing experiment. The Naish wing is out. Better name, but no windows. I think they are making a mistake without windows. They are really needed. Can’t be too hard to add in a few windows.